Shakshuka. Say it with me again but properly. SHAK-SHU-KA! What fun. With a name like that, one would expect a bold and powerful dish and I’m proud to say that the final product doesn’t belie the name. This recipe heralds from the lands of North Africa and the Middle East and is as common a dish as falafel within the region and rightfully so. 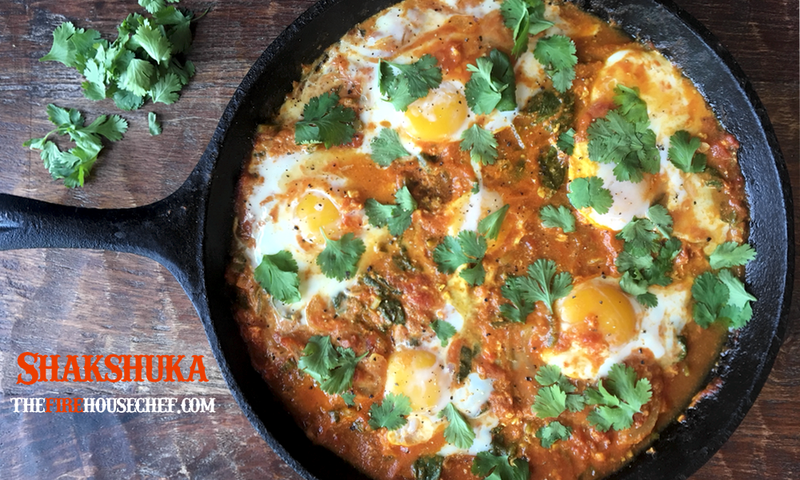 All the right notes are hit; acid, spice, heat… Shakshuka indeed! Peppers and onions stewed in spicy tomatoes with poached eggs is a great way to start the day in any land and a worthy addition to your firehouse. The best part being that this is a one-pan meal and is most at home in a reliable firehouse cast iron pan. A few after the fire critiques: This is traditionally a part of a hearty breakfast dish but feels just as good as a lunch or dinner. Consider serving over a piece of toast (did someone say Naan?!) or over a bed of roasted root vegetables with a nice side salad. Lastly, can’t find any turmeric (you really should search this spice out) or Swiss Chard? Substitute with cumin or spinach respectively. Lastly, I love to sprinkle either Feta or Queso Fresco over the top to add some brine cheese flavor to the meal. Place pan over medium-low heat and heat 1 Tbsp OO. Add onions, pepper and poblano and cook 20 minutes. Make well in middle and add additional 1 Tbsp. OO, paprika, turmeric and garlic to bloom for 30 seconds then mix to combine. Add tomatoes and tomato paste and ½ C water then bring to a simmer. Cook for 20 minutes. Add Swiss chard on top and cover with lid and cook 5 minutes. Remove lid and mix in Swiss chard until combined and cook additional 5 minutes. With a large spoon, make 6 shallow wells in the sauce and carefully crack eggs into them, place lid back on and cook till whites are set on the eggs 8-10 minutes. Remove from heat, top with cilantro, season with salt, pepper, splash of EVOO and a pinch of paprika and serve immediately. Indulge!